This is the first English translation of one of Korea's most celebrated historical works, a pre-modern classic so well known to Koreans that it has inspired contemporary literature and television. 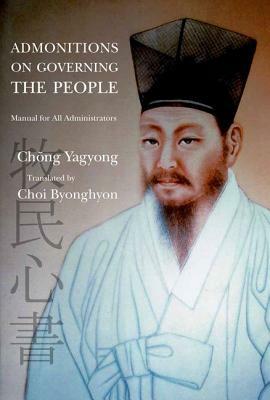 Written in 1821 by Chong Yagyong (Tasan), "Admonitions on Governing the People (Mongmin simso) "is a detailed manual for district magistrates on how to govern better. In encyclopedic fashion, Chong Yagyong addresses the administration, social and economic life, criminal justice, the military, and the Confucian ritual system. He provides examples of past corrupt officials and discusses topics of the day such as famine relief and social welfare. A general call for overhauling the Korean ruling system, the book also makes the radical proposition that the purpose of government is to serve the interests of the people. This long-awaited translation opens a new window on early-nineteenth century Korea and makes available to a wide audience a work whose main concerns simultaneously transcend national and cultural boundaries. Description: A clean, unmarked book with a tight binding. 1134 pages. Previous owner's name inside. Sticker residue on dust jacket. Full black cloth boards.